You don’t need to exert yourself; the water does most of the work. Visibility of 30 to 40 feet is common. Limited bottom time is not an issue, as you are never deeper than 30 feet and generally no deeper than 15 feet. Summertime water temperatures can be 70° F.
You can find antique bottles and other historic artifacts. Don’t be surprised if your dive buddies include walleye, sturgeon, pike and gar. The trip takes place over a weekend. You can dive just Saturday, just Sunday, or both days. With four different entry and exit points, you are not likely to see the same thing twice. The host facility for this trip is the Riverside Park Motel and Campground. 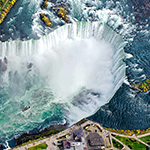 You can choose to camp out, stay at the motel or choose another hotel in the Niagara Falls area (accommodations are not included in the trip price). The dive site is three hours by car from Cleveland. You need to allow time for border crossing into Canada and back into the United States. It’s best to plan on spending the night before the dives in Canada and, possibly, staying an additional night before starting back to Cleveland. We will need a copy of your passport at sign up. Your passport must be valid for six months past the date of the trip. Divers must be able to present a certification card.